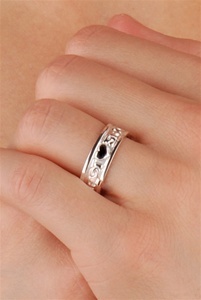 Solid Sterling Silver Ladies Celtic Wedding Ring. Inscription on the ring: GRA DILSEACHT CAIRDEAS (means: "LOVE, LOYALTY, FRIENDSHIP" in Irish Gaelic Language) Excellent Quality. Made in Dublin, Ireland. This is an authentic Celtic Wedding Ring made by master artisans. Measurement: 6.0 to 6.1 mm wide. Available also in 14K Gold. Available sizes 4 to 11 with half size increments. It is handcrafted in Dublin and hallmarked in the Assay Office located in Dublin Castle. Love the ring! Perfect fit. Shipping was amazingly fast. Very happy. Look forward to doing business again in the future! Thank you! Just wanted to say how pleased I am with your product, customer support, and shipping. Items were recieved on the date as promised and the quality was perfect and engraving was better then I have received in a local jewelry store and paid 37.96 for the very same engraving. I plan on telling others about your quality and high customer support!!! THANK YOU!!!!!!!!!!!!!!!!! !